Each year a few ambitious travelers embark on bicycle journeys through Russia and Central Asia. Some cyclists ride across all of Siberia while others visit Russia as a side trip from neighboring countries like China, Mongolia, or Kazakhstan. Long distance bicycle trips require what’s called a touring bike—a strong bicycle, generally with a steel frame, that can hold heavy equipment. The Adventure Cycling Association publishes a yearly guide on purchasing touring bikes. If you plan to mostly cycle on main roads in Russia, a touring bicycle is a great choice. But because most roads in rural Russia are unpaved, a mountain bike might be a better option for riding in the country. If you’re going to spend most of your trip cycling in Russia on backroads, opt for a mountain bike instead. Bringing a bicycle on an airplane requires taking it apart and putting it in a shipping box. City Bikes offers a complete guide , with pictures, on how to box up a bike. Alternatively, most bike shops will box your bike for a small fee. British Airways allows passengers to travel with a bicycle for free as part of their checked baggage allowance and flies to nine cities in Russia including Moscow, St. Petersburg, and Ufa. Russian carrier Aeroflot also permits passengers to fly with bicycles for free as part of their checked baggage. Aeroflot has connecting flights to all major cities in Russia and flies to North America, Europe, and Asia. To carry your stuff on tour, you’ll need a pair of waterproof panniers—saddlebags that hang from racks over the wheels of your bike. Surly Bikes offers front and rear racks made of steel that will hold up under rough riding. The Ortlieb Classic Front and Rear Rollers are some of the most popular and durable panniers on the market today. Other useful accessories on any bike tour are a PETZL Headlamp , a Camelbak H.A.W.G. Backpack for carrying water, a bug jacket for the summer mosquitoes, orange visibility vests and flashing tail lights to make you stand out to drivers, bike locks to secure your bicycle in cities, dry bags to give your clothes an added layer of protection against the rain, and bicycle helmets . Many cyclists have posted their complete gear lists on the website www.crazyguyonabike.com . Most major cities and small towns in Russia have hotels. But unless you’re traveling in populated areas of European Russia, like the Golden Ring, you will probably need a tent. The Sierra Designs Lightning 2 tent weighs just 1.56 kg and is a good lightweight option for 1-2 people. Even in summer, temperatures in Russia can become cold at night, so it’s recommended to take a warm sleeping bag like a North Face Green Kazoo and a sleeping pad for added insulation. In Siberia, you can camp almost anywhere, but it’s always a good idea to ask permission first if there’s a house nearby. Some cyclists prefer to cook on portable cookstoves, like the MSR WhisperLite Stove , while others prefer to eat out. If you’re riding on back roads in rural Russia, stock up on supplies beforehand and plan how much food you’ll need to make it to the next city. Broken bicycles or bad roads can slow you down, so anticipate that your journey might take 3-5 days longer than expected and bring enough food to tide you over. In European Russia, or on the M-56 Federal Highway—the main road across Siberia—you can usually count on finding a roadside cafe every 50-70 kilometers. Russian cafes are quite affordable and offer a broader range of food options than you might find in most stores in small Russian towns. Many Russian cafes will also allow cyclists to camp in their yards. By sleeping at a cafe, cyclists can eat both dinner and breakfast without having to cook and wash dishes. If you find yourself on the road in Russia without a good map, many gas stations carry regional maps. If you prefer to travel with a GPS system, the iPhone is now compatible with Russia’s GLONASS (Global Navigation Satellite System) which can help cyclists obtain accurate maps anywhere on the road in Russia. The website www.crazyguyonabike.com is a treasure trove of information about cycle touring in Russia and all over the world. You can search the website to find gear lists and blogs written by other cyclists. Writer Mark Jenkins completed the first coast-to-coast crossing of Russia on a bicycle, from the Sea of Japan to the Gulf of Finland, in 1989. Jenkins wrote a book about the experience called Off the Map . In 1999, Australian Tim Cope embarked on a 14-month bicycle trip across Russia, Mongolia, and China with his friend Chris Hatherly. The two co-authored a book about their experience entitled Off the Rails . You can also go on a guided bike tour in Russia. 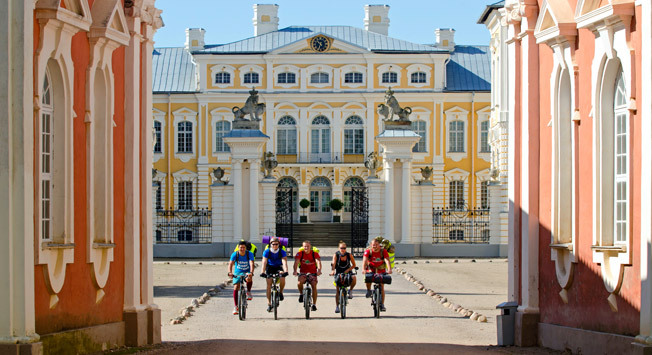 The Russian Cycle Touring Club runs tours each summer around the Golden Ring or between Moscow and St. Petersburg. Cyclists can choose from more expensive ‘Comfort Tours’ with accommodation in hotels or ‘Adventure Tours’ with nights spent in rustic cabins. Tours last 6-10 days and average $1,200-2,500 per person. If you prefer to cycle in Russia without going on a tour, the Club will sponsor your application for a Russian visa . In Siberia, the travel agency Sayan Ring arranges several bicycle tours for experienced cyclists. Tours last a week and cyclists travel in rural parts of Siberia where you must sleep in tents. Write to info@sayanring.com for current prices. Sayan Ring also organizes a seven-day bicycle tour in the winter. Cyclists ride around the frozen expanses of Lake Baikal in eastern Siberia and sleep in cabins at night. The tour costs $1,500 and includes accommodation, meals, bicycle rental, guide service, and a dog-sledding trip.